There are several options to get to Peniche from Lisbon airport. Take the A8 motorway in the direction of Leiria. Follow this motorway for about 40 minutes and turn off onto the IP6 towards Peniche. Continue straight for approximately 25 km. 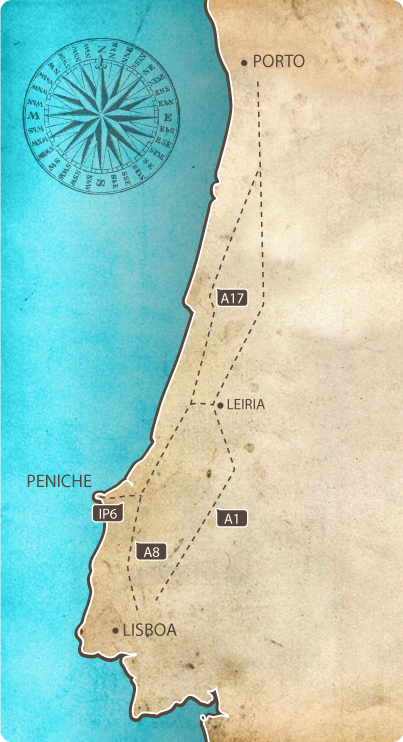 There is a regular bus service between Lisbon and Peniche. The coach station is situated close to the Jardim Zoológico metro station that you can reach by taking Aeroshuttle at the Lisbon airport (leaves every 20-25 minutes from 7:30 am till 11pm). Be sure to let us know your travel details, so we can be there to greet you on your arrival at Peniche bus station and transport you to your accommodation. We’ll meet you at Lisbon airport in the indicated time and you’ll arrive at your accommodation in Peniche or Baleal comfortably and safely. Our airport transfer offers you fixed price, no matter if you get stuck in traffic jam or your flight is delayed. It's a ride fare which means you can share it with your friends and split the cost equally between you (check the prices here).